This weekend I sat in the garden, the sun shining, and read the most beautiful, lyrical and vividly written book – Let Me Tell You About A Man I Knew. This isn’t the first book I have read by this author (more on that later) so I knew that I was in for a treat and I wasn’t let down in the slightest. This book is a feast for the senses. From the very first sentence, I was whisked immediately away to the Provencial countryside as a new spring is dawning and I was immersed in colours and fragrances and sensations that can only be brought about by the most talented author. I was there under the lime tree, I felt the breeze lift the hem of my skirt, and heard the parched earth drink the water from the upturned pail. The man of the book title is, in fact, Vincent van Gogh, however, he isn’t the protagonist; that is Jeanne Trabuc. Van Gogh is more of a supporting character to enable Jeanne to evolve and blossom, and the story is really hers. The year is 1889 and set in the Saint-Paul Asylum, Saint-Rémy, where Van Gogh admitted himself and was a patient for a year, painting some of his most loved paintings during that time before he became more well known. Jeanne lives with her husband Charles in a little white cottage next to the asylum in the French countryside as Charles is the Manager there. Jeanne, whose three grown up sons have all left home, lives by the rules she has become accustomed to over the years and is forbidden to enter the asylum grounds but she finds a way to meet with Vincent often and through their conversations while he paints, she learns to remember the woman (and child) she was; the playful, independent girl who grew up with just her belovèd Father and wore yellow silk dresses, wore her hair unpinned, and who did handstands in the square. It’s an incredibly moving story as Jeanne considers her life and contemplates her future. Van Gogh’s paintings awaken something in her; a desire and a longing for something more than the life of conformity and routine. Seven years ago, I interviewed this author about her book Corrag (which is now re-published as Witch Light and is still one of the most perfect books I’ve ever read) and in this interview, she explained about spending half-an-hour of watching a bumble bee visit foxgloves, writing down how it looked and sounded, and I can completely see this. The scenes of nature in both books are exquisite; full of vibrancy and sentiment. Just stunning. When I read a book I want to believe I’m right there in the pages. Few authors make me feel this as well as Susan Fletcher. Others that have had a similar impact are Joanne Harris (particularly the Chocolat series) and more recently Sealskin by Su Bristow. Have you read this book or anything else by Susan Fletcher? I’d love to know what you think. This beautifully and poetically written book is set in the small town of Helensburgh, Scotland in the dual time-frame of now (Dora) and 1930 (Wystan). 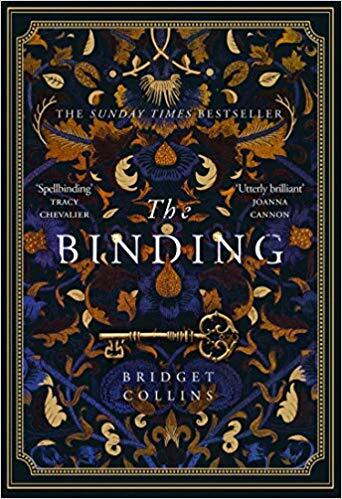 Dora Fielding is a newly-married poet from Oxford and moves to the rather insular town of Helensburgh for her husband Kit’s job, while pregnant with their first child. Thrown into motherhood, and newly jobless and friendless in this small town by the sea, that seems to treat newcomers with not just suspicion but utter contempt, Dora finds herself becoming so isolated that she fears she has lost all sense of her former self and struggles to work out who she really is now. However, when she learns that famous and respected poet W.H. Auden (Wystan) also used to live in Helensburgh, Dora becomes fascinated by finding out more about him. Back in 1930, Wystan is having his own problems with being an outsider when appointed as a teacher at the school Larchfield in Helensburgh, and worse than that an English one who dresses eccentrically and attracts rumours of being a pervert (or, homosexual to you and I) which is something that Wystan himself is trying to come to terms with in an age when it was not only not acceptable but illegal. Preferring a pen and paper to racing around a rugby field, Wystan is ostracised by most of his peers and finds solace in the friendship of a dying middle-aged woman and a private affair with a local man. It isn’t clear, other than the themes of loneliness and unacceptance and survival, how Dora and Wystan will be thrown together until about half way through the book. Forced into her own fantasy to escape the reality of bullying neighbours and her loss of any sense of who she used to be, Dora forms a friendship with Wystan that allows her to escape her stifling and frightening reality. Apparently, the author based Dora’s experience on her own, having also relocated to Helensburgh with a small baby and anti-English feeling following her around and the isolation and frustration could be clearly felt through the pages. It was obvious to me, reading this book, that author Polly Clark is a poet as the narrative is lyrical and tender and what felt, for me, a gentle and quiet read despite the themes: loneliness mental health, courage, bullying among them. It certainly didn’t feel like a debut novel and it captivated me from the start with its strong sense of empathy and humanity. Have you read Larchfield? What did you think? I came to The Mountain in my Shoe with no expectations, only recently having heard of it. I instantly fell in love. The overwhelming feeling I had reading this book was what a breath of fresh air it was. Although classed as a psychological thriller, for me it felt worlds apart from the masses that are out there at the moment (for a start it didn’t have the words girl, sister or husband in the title) and there wasn’t the promise of a twist that I will never see coming (but that I end up guessing by a quarter of a way in). I loved the simplicity of the narrative but yet there was nothing simple about it at all; it was lyrical and exquisite and unique. Bernadette loses three things on the same day: her husband (whom she is about to leave), 10-year-old Conor (a foster child she befriends and who disappears after school) and Conor’s Lifebook that she is looking after. Narrated in turn by Bernadette, Conor and interspersed with snippets from Conor’s lifebook, we learn of the events that lead up to this day and follow the efforts to find Conor. This isn’t a traditional race-against-time plot to find a missing child, it’s so much more than that. It’s a revealing and heartbreaking look at a child’s experience of the care system and relationship with his real mother, and it’s about a suffocating and stifling marriage with a partner that controls every move you make. With complex issues such as mental health and abusive relationships, it’s deeply moving yet incredibly sensitively executed. A stunning book. I found it incredibly refreshing to read something so beautifully written and emotive. Despite the themes of the book, do not expect this to be a gloomy or tough read, it really isn’t. It’s heart-warming and life-affirming and I will be recommending it to everyone I know. There are many books that don’t want to seem to let me go after I have finished those final pages; books that I can’t stop thinking about or that haunt my thoughts for days, even weeks afterwards. I love those books – the ones that get under your skin. However, how many of those book do I still remember years later? Yes, there are books that I look back fondly, even passionately upon, but it is a really special book that stays in my mind so vividly years and years later that every now and then I will be taken completely unawares when one of the characters sneeks into my head and waves hello. One such book that has that effect on my is Memoirs of a Geisha which I read in the summer of 2003. I can clearly remember entering the Japanese tea houses and walking under the cherry blossom trees so much so that whenever I looked up from my book I was surprised to find myself still sat on a sofa in a house in Yorkshire. I was so emmersed in sayuri’s life for the few days that it took me to read it that I actually felt as though I’ve lost a friend once I had finished: I felt lost without her and her world. Even now, every now and then, I find myself thinking about not only Sayuri but also Mameha, the Chairman, Nobu and even Hatsumomo and wondering what became of them. Memoirs of a Gesiha is a breathtakingly beautiful book and one that will stay with me for a long, long time. And when I stop remembering…..I will read it again. Which books have you been able to let go of even years later?